Cut green chilies & cilantro.Melt butter. Check the doneness of potatoes (use a knife). When potatoes are done, remove from heat and peel them. Add salt, red chilies, green chilies, pomegranate seeds, cumin seeds & cilantro leaves and mix well. Crack and mix two eggs in a steel bowl. Put melted butter or oil in a fry pan and put on medium heat. Flatten these 2 inch balls to make kebabs. 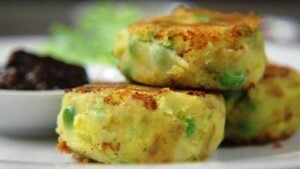 Coat kebabs with eggs and put in frying pan. Change side after 5 minutes.